Following Apple’s random selection of WWDC tickets last week, Apple is reportedly reaching out to devs who lost out on the ticket selection. Developers who previously won tickets but did not claim them have lost the opportunity to purchase a conference ticket; unclaimed invitations has been recycled to those who did not receive tickets. WWDC tickets cost $1599. The conference begins June 2; expected to debut is iOS 8 and OS X 10.10. 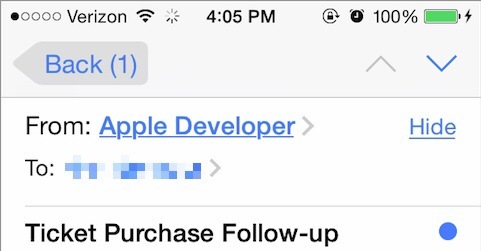 This entry was posted in Apple, iOS, Mac, Tech Industry and tagged iOS 8, OS X, OS X 10.10, WEDC, WWDC 2014. Bookmark the permalink.